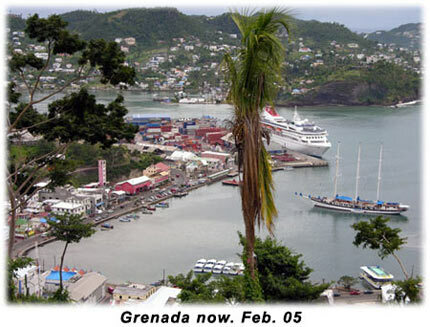 Grenada is located at the southern end of the Windward Islands, at the very edge of the hurricane belt, and had not experienced a hurricane for a little over 49 years. 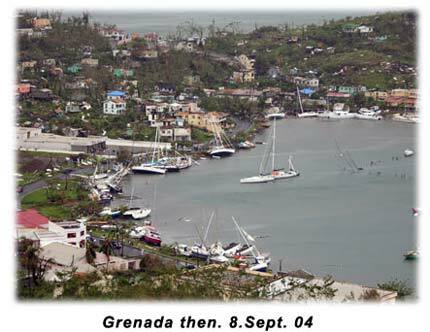 However, on September 7th 2004, Ivan, a category 4 hurricane, badly damaged our lush rain forest and over 90% of the buildings were destroyed. Roads were filled with a mixture of trees, power lines, roofs, and bits of masonry. The north, mercifully, avoided the worst. Carriacou was relatively untouched. Communication came to a standstill as electricity and phone lines were ripped away. Roads were clogged with debris. The airport was shut. Nevertheless, this beauty is making a rapid comeback because of its natural resilience, and our white sand beaches are untouched. Our accommodations , which were damaged, are being repaired and several are now open for business, with the larger properties sheduled to re-open in about a year. Needless to say, there is still a lot of rebuilding being done, and still to be done. There are still a lot of people who need assistance because their homes were destroyed, but people are slowly getting their lives back in order. We have shifted our emphasis from supplying food aid, to rebuilding materials, and will end our relief efforts when all the donations have been given out. However, even though we will not be actively involved in supplying relief aid, we will continue to post updates on this website, with a listing of organisations who are actively involved in the rebuilding process, with contact information. For the new year, we have shifted our emphasis to supplying building materials with the funds which were donated to us. In January, we distributed roofing materials, plywood and wood to several people who were not recieving any assistance. Since then, we have gone and done a small survey in the St.Davids area to see who need our assistance the most, and what materials were urgently needed. Consequently, this week we will be returning there to supply some of the residents with the basic materials needed. As our funds are limited, we have had to ensure that this goes to the most needy, hence the delay in getting it out.